b. You can simply write what you would place into your time capsule and why. It is much more fun to create though! You may choose to create a time capsule for your children, or a niece/nephew, for grandchildren – A physical item that you will give to a named person. Why have you chosen that person and when do you intend for them to have it? You may choose to create a time capsule of your home and leave it for someone in the future to find. If you create a physical time capsule, what did you choose to use as your capsule and why? At this time, I am going to write about what I would put in a time capsule. Eventually, I want to put one together for my kids. It would be something that I hope they could open and share with their own children. 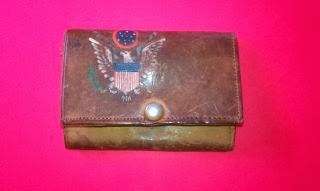 My paternal grandfather's wallet. Here's a picture of it. I have shown them this before but they are still to young I think to appreciate the significance of it. I worry that it may accidentally get thrown out somewhere along the way so putting it in a time capsule may be the best way to ensure that someone may discover it in the future. Some examples of my son and daughter's school work. I think they would get a kick out of seeing their own writing from when they were children. A lock of hair from each of them. A newspaper from the day the time capsule is buried. A note telling them how much their parents loved them. Since I think taste in music tells a lot about a person, I think I would include a list of my favorite songs and the artists who sung them. A list of my favorite movies too. A picture of what my house looked like on the day the time capsule is buried and for that matter pictures of my husband and kids as well. A picture of their father from when he and I visited the Grand Canyon. In this picture, he has this wonderful look of amazement, happiness, and that all things are possible in his eyes. A recording of my voice telling them about some of the oral history that was passed down to me about our family. Another note reminding my kids to continue to read, learn, adapt, and thrive.